The outrigger beam on a city type All Terrain crane badly damaged three cars as it extended while travel to a job in Farnham, Surrey, in the UK yesterday. 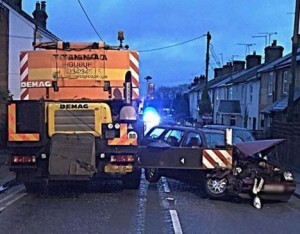 The crane, a two axle Demag, owned by Terranova Crane Hire, was driving down a residential street in the early hours when the beam extended, damaging three cars, but fortunately causing no injuries. A statement from Surrey Police stated: “Surrey Police was called to Upper Hale Road, Farnham at 5.22am today following a collision involving a Vauxhall Corsa, Ford Fiesta, Volkswagen Golf and a mobile crane. The crane experienced a hydraulics failure, causing the support leg to be extended outwards there were no injuries”. Alec Glover of Terranova is quoted in the local newspaper as saying: “These cranes have certain safety features, the riggers cannot deploy while travelling, but the rigger deployed itself. It bypassed its safety features and opened while travelling. We are in the process of speaking to the manufacturer about what caused this. The crane driver could not see the leg being deployed, if he had seen it he would have stopped”.